Is Morning Sickness Ruining Your Teeth? Morning sickness is a commonly used term to describe the nausea and vomiting that affects many women during pregnancy. It’s a bit of a misnomer, as most women who experience this phenomenon say it actually happens throughout the entire day and not just in the mornings. Morning sickness affects between 70-85 percent of pregnant women! While most women experience morning sickness in the first 16-20 weeks of pregnancy, some of the unlucky ones have symptoms throughout the entire pregnancy. Morning sickness affects a person’s ability to work, perform necessary tasks around the home, and/or care for children or other dependents in the household. Many women state that morning sickness forced them to reveal their pregnancy earlier than they would have preferred. How Does Morning Sickness Affect My Teeth? The reason morning sickness is damaging to teeth is that the nausea and vomiting brings acid from the stomach up into the mouth. Healthy stomachs are filled with acid, which breaks down food as an important part of the digestion process. However, that acid is supposed to stay in the stomach. Stomach acid has a pH of 1.5-3.5. In contrast, a healthy mouth has a pH that is slightly above neutral, in the range of 7.1-7.5. Teeth can stay strong at this pH. The enamel covering our teeth begins to weaken when the pH drops to 5.5 or below. When someone vomits, the acid in the stomach is pulled up the esophagus and into the mouth. This stomach acid is far below the pH threshold for enamel damage. When the mouth is subjected to this strong acid with such a low pH repeatedly, the enamel is weakened and may begin to erode. Enamel erosion is the gradual degradation of the enamel surface of teeth caused by exposure to acids. This includes any acid, like sodas, lemon juice, and any carbonated drink. Because stomach acid is more acidic than these things, it can cause more damage in a shorter amount of time. The photos below show examples of severe enamel erosion. The enamel becomes thinner and is even missing in some areas. On front teeth, this can cause the teeth to appear translucent or “see-through”. 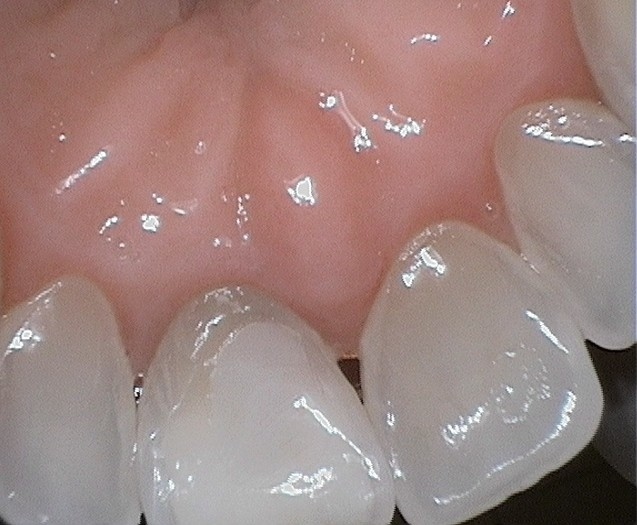 On back teeth, the enamel can erode away from a filling, leaving the filling taller than the tooth surface. Because enamel is a tooth’s defense against decay, anything that weakens enamel makes a tooth more likely to get a cavity. Loss of enamel also causes tooth sensitivity. How Do I Protect My Teeth From Morning Sickness? There are several steps you can take to protect your teeth if you are suffering from morning sickness. After vomiting, do not immediately brush your teeth. Rinse your mouth thoroughly with water, wait 30 minutes and then brush. Use an over-the-counter mouthrinse that contains fluoride before bed each night. Fluoride can strengthen the enamel and protect it against acid. Chew sugar-free gum throughout the day. This stimulates your natural saliva production, which raises the pH in your mouth. See your dentist. If you are suffering from morning sickness, let Dr. Aanenson and Dr. Kuiper know. They can assess your risk for enamel erosion and make specific recommendations for you. What Else Can Cause Acid Erosion of Teeth? GERD – Severe acid reflux can keep the pH in the mouth much lower than normal. Bulimia – As with morning sickness, consistent vomiting causes enamel erosion. Lemon juice cleanses – Lemon juice is as acidic as stomach acid and should never touch the teeth. Are You Suffering With Morning Sickness? Call our office at 605-925-4999 (Freeman) or (605) 928-3363 (Parkston) to schedule your appointment today with Dr. Jason Aanenson, Dr. Alex Whitesell or Dr. Serena Whitesell! They can help you manage the risks associated with morning sickness and help you protect your teeth.